Escape to the lake house no matter where you live. Our whimsical Beaufort group incorporates nautical details, including a canoe-base cocktail table, captain’s wheel martini round and oar-frame accents. In Oak veneered hardwood with extra-thick, beveled edge glass. Materials: 12mm tempered clear glass with OG edge, Hardwood Solids, Oak veneer, Antique Brass Lock, Floor Protectors, Antique Bronze hardware. All pieces are constructed of hardwood solids, oak veneer and glass. All pieces feature 12mm tempered clear glass with OG edge on top. All pieces except cocktail table features wooden base. 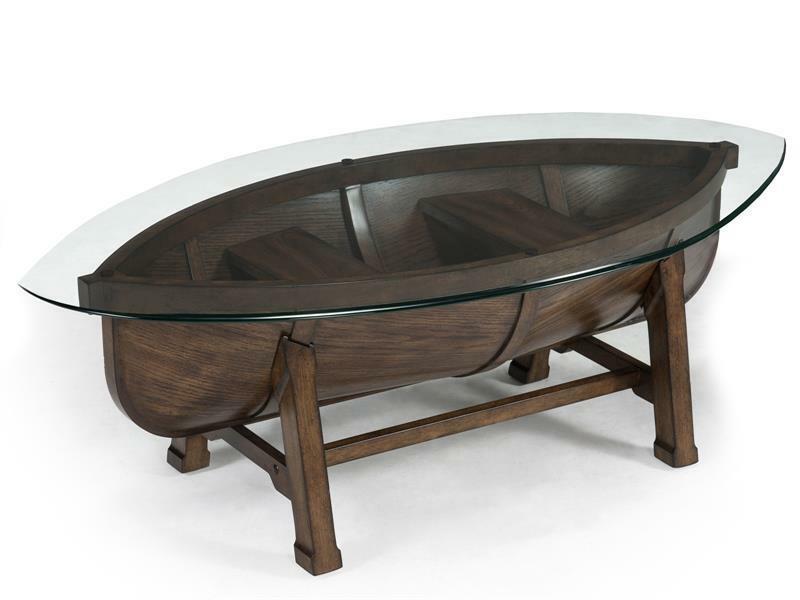 Cocktail table features storage under glass top with boat shape.